One must walk barefoot on the grounds of a Hindu Temple. At the Ramanathaswamy Temple, the approach to the temple begins several streets away, and all this ground is sacred and belongs to the temple; walking barefoot over the cobbled stones and occasional debris can be a bit of a challenge. Inside the temple, it is cool and dark. Through large windows, one can see through to the outside, where the temple is surrounded by 22 theerthas. These are huge sacred tanks; pilgrims are blessed by immersion in the water. This is generally accomplished by people filing by as a priest pours an entire bucket of water over each of their heads. Still dripping, the pilgrims then enter the main part of the temple. In the floor near the entranceway, are shallow channels which carry away the water. Thousands of years ago, during the course of rescuing his wife Sita, the ancient King Rama killed her abductor, the demon-king Ravana. The problem that arose, however, was that Ravana, even though he was not a very nice fellow, was a Brahmin – and this meant that by killing him, Rama was guilty of the sin of Brahmahatya, or killing a Brahmin – a sin that had to be expiated. So Rama, on his return from Lanka with the rescued Sita, stopped at the site, where today the Rameshwaram temple stands, to worship Shiva and to be cleansed from his sin. The very ancient site was sacred to Shiva even then. 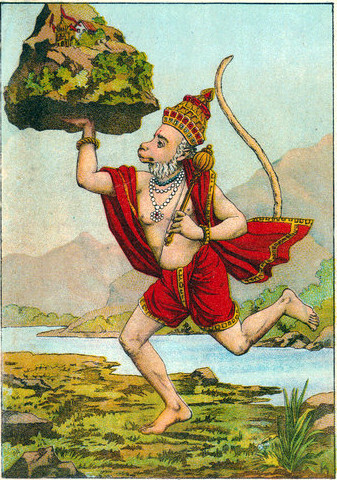 Rama sent his trusted friend the monkey God Hanuman to go to Mount Kailash to bring back a shivalingam, a representation of Shiva, to install in the temple. Mount Kailash is in the Himalayas, thousands of miles north of Rameshwaram which is in the far south of India, so, even though Hanuman could fly, it took him a while. It took so long that in the meantime, Sita had built a small lingam out of mud and placed it in the temple. When Hanuman returned with the large stone lingam he had brought from the far north, Rama decreed that both lingams would always remain in the temple, where they are today. Like other ancient south Indian temples, the Ramanathaswamy Temple is surrounded by a high rectangular wall which runs 865 feet from east to west and 657 feet from north to south. The temple is at least as old as the time of the Ramayana, which may be around 1,000 BCE or maybe older. In the beginning, it was a simple shed in the charge of a hermit. The building of the temple in its current form was begun during the Pandyan Dynasty of south India. Other kings added structures from the twelfth through the seventeenth centuries CE, gradually expanding the temple to the huge complex it is today. The temple contains the longest temple corridor to be found anywhere in the world; the outer wing of the third corridor goes 690 feet east and west, as well as 435 feet north and south. Standing at the corner where they meet in a right angle, one can look a very long way down one way and then down the other. On either side of the corridor, 1212 carved columns rise from five foot high platforms and stretch 27 feet up to the ceiling. There are also inner corridors. Rameswaram is one of the four holiest places of pilgrimage in India; these lie in the four directions. They are Varanasi (Benares) in the north, Puri in the east in Odisha, Rameshwaram in the south, and Dwarka in the west. Rameswaram is sacred to both Vaishnavites and Shaivites, both those who worship Vishnu and those who worship Shiva. Top photo: Purshi / Wikimedai Commons / “This file is licensed under the Creative Commons Attribution-Share Alike 3.0 Unported license.” / One of the long corridors. Second photo: Painting by an unknown artist around 1920. /Wikimedia Commons. / “This work is in the public domain in India because its term of copyright has expired.” / A depiction of the ten-headed demon-king of Lanka, Ravana. Third photo: Vinayaraj / Wikimedia Commons / “This file is licensed under the Creative Commons Attribution-Share Alike 3.0 Unported license.” / One of the gopurams or gates of the Temple. The hero, Rama, a resplendent blue figure, stepped up to the bow. Not only did he lift it, but he held it aloft, and with a resounding crack, Rama broke the bow! With this astounding feat, Rama won the right to marry the beautiful Sita. 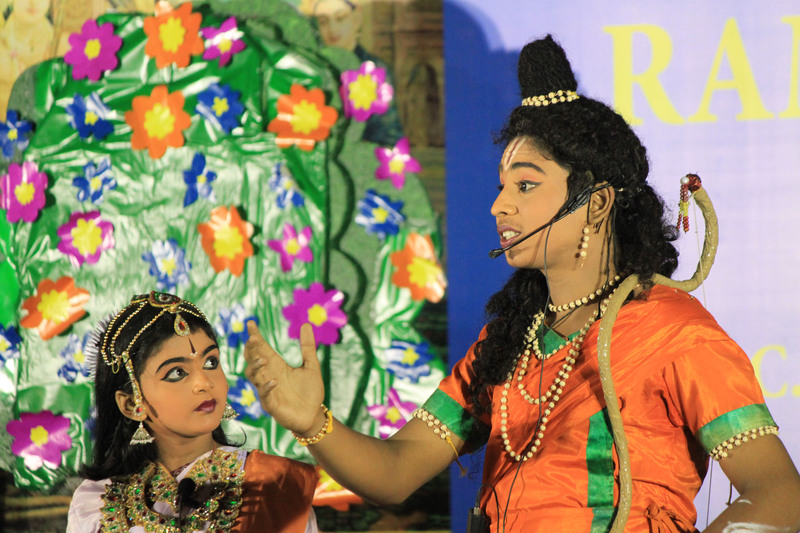 500 children cheered, watching the marionettes wide-eyed in amazement as they enacted the age-old story of Rama and Sita, at the C.P. 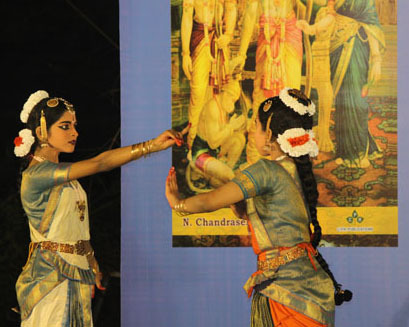 Ramaswamy Aiyar Foundation in Chennai, India, presented on Saturday, February 16, 2013, as part of a month-long celebration, the Ramayana Festival. Children from the Grove School and the Saraswati Kendra School, both run by the C.P. 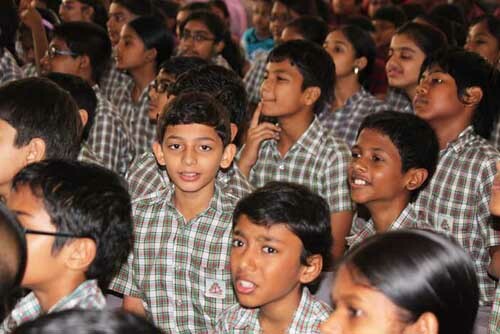 Ramaswamy Aiyar Foundation, as well as other children, attended. T.N. 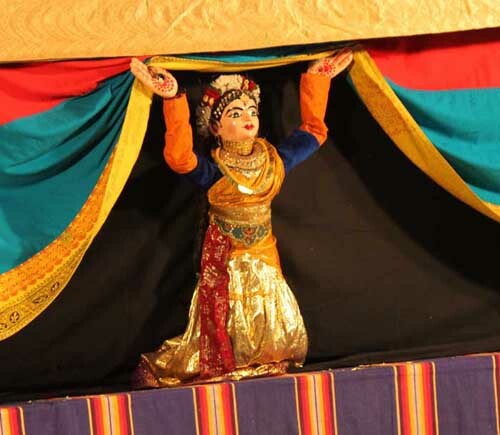 Shankaranathan, now 85 years old, his son Murugan, and six others make up the marionette troupe that brought so much life and magic to this spectacular performance. They traveled to Chennai from their homes in Kumbakonam, bringing with them their elaborately costumed and beautifully crafted marionettes, each over two feet high. They are part of the few-thousand strong Sourashtrian community, descendants of people who left Gujarat 400 or 500 years ago. To escape the threat of forced conversion to Islam, they traveled south to Tamil Nadu, settling near Madurai. Most were weavers, and some remain weavers even today. Many decades ago, T.N. Shankaranathan and two of his brothers along with their families were taken in and looked after by a well-off family from Kumbakonam, and there he learned his craft from the famous puppeteer, Mani Iyer. He and his son Murugan, along with Vasan, one of the C.P. Ramaswamy Aiyar Foundation officers, sang the music for the performance, which was dramatic, plaintive and joyful in turn. All was whimsical, sprinkled with many comical moments, and with an underlying thread of a deeper meaning. The show was entirely in Tamil. One of the marionettes, a clown, spoke a few profound words at the beginning, “We are all marionettes, attached by strings that pull us this way and that; we are dolls, and it is our duty, while we are here in this life to do as much good as we can.” Of the history of marionettes, he said, “We are not one hundred years old, or even four or five hundred or a thousand years old. Marionettes are as old as the stones of the earth.” He gave an ecological message too, about protecting and caring for the earth, the animals, and plants. 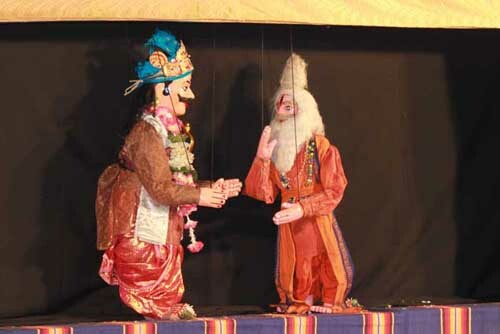 As the marionette play began, following the Ramayana story by Valmiki, the old and very powerful rishi, Vishwamitra, is asking the King Dasharatha, to allow his son Rama to go with him, to be trained as a warrior and then to do battle with the horrid demoness Tataka. 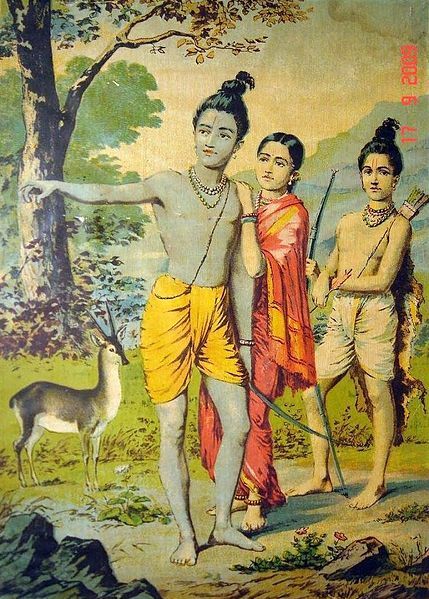 Reluctantly, the king consents and Rama, with his brother Lakshmana, sets off to be trained in warfare by Vishwamitra. The demoness Tataka is killed by Rama, the only hero who is strong and righteous enough to kill her. Her son Maricha is chased away, to live, then to die at Rama’s hands much later in the epic. A pale, skeletal ghost appears too, looking appropriately terrifying and is also dispatched with. After Rama breaks the gigantic bow, which is Shiva’s bow, King Janaka gives him the hand of his daughter Sita in marriage, and there is a scene of great joy and celebration as the two are happily wed. Rama and Sita exchange garlands and are given long beautiful stoles. The marionette story ended here on this joyous occasion, though this is just the first chapter of the traditional tale. The captivating story of Rama and Sita, one of the most enchanting stories in the world, is performed and read not only in India, but wherever Indian traditions and stories have spread over the centuries, especially throughout Southeast Asia. As an avatar of Lord Vishnu, Rama is worshipped by hundreds of millions of Hindus. 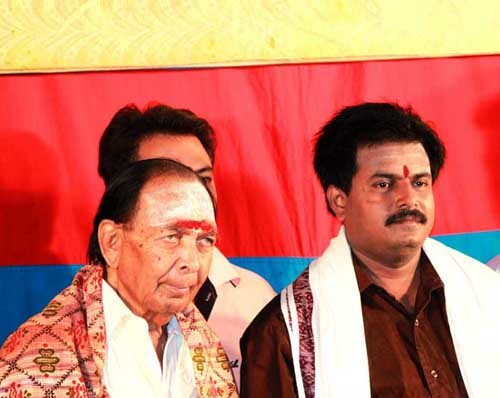 Earlier, on February 1 and 2, at the Ramayana Conference, put on at the C.P. Ramaswamy Aiyar Foundation, a mountain of evidence was presented by scholars in support of the view that the story, long considered by western authorities to be a myth, was based on historical reality, and that Rama was not a myth, but a historical king of early India. 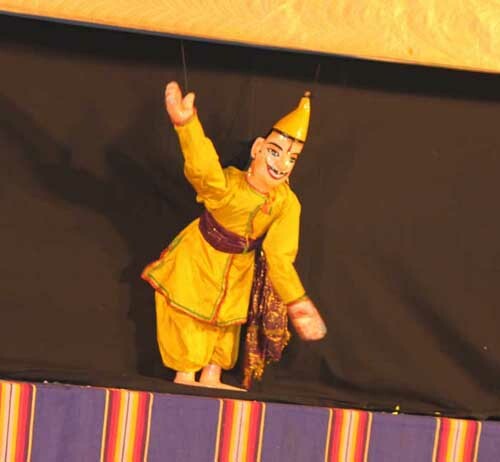 This marionette troupe is the last one remaining in the state of Tamil Nadu. They carry on a lovely, meaningful tradition, handed down through many generations. To visit the website of the C.P. Ramaswamy Aiyar Foundation, click here.